A great poet once said that no man is an island. He was more right than he could possibly have known. Each one of us is not an island, but a community, an ecosystem, if you will. Each one of us has a number of creatures who depend on us for a meal, or a place to live. Most people despise these dependants who live off us as disease carrying parasites and seek to get rid of them at any cost. Roger M. Knutson might disagree. Roger Knutson is a biologist who has written Furtive Fauna, a field guide to the creatures that live on us or near us. Knutson asserts that our dependants are more to be pitied, even respected, than hated. After all, the human body is not exactly an easy environment to live on. In Furtive Fauna, Professor Knutson catalogs the many creatures that live with us. He starts with the occasional visitors, like ticks, flies and mosquitoes who like to drop by for a quick snack. He then moves on to some of our neighbors, bedbugs, fleas, and others who live in our clothes and bedding. These neighbors, like any good neighbor, often visit us, and like good hosts, we provide them with food and shelter. Then, there are our friends and companions; lice and mites, who like to live with us and keep us company. You can never feel lonely as long as you know you have mites living on you. Finally, we have the friends that are too small to see, like bacteria. They are everywhere and we could not live without them. Roger Knutson’s descriptions of the various furtive fauna are brief, humorous, and fun to read. 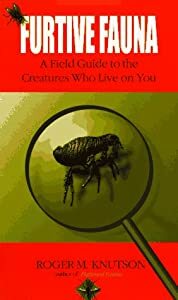 You may never come to love the little beasts that live off you, but after reading Furtive Fauna, you will never think of them in quite the same way.